Believe it or not, Easter is next week! One of the most fun things to do for Easter is dye Easter eggs. First things first, if you are planning on eating the eggs you are going to dye, choose an egg that has been pasture-raised, and is soy- and antibiotic-free. If you are looking for bright colors, it is best to choose white eggs; if you are going for a more rustic look, brown eggs would work best. Also, keep in mind, it may take a little extra time when dying brown eggs, due to the naturally darker shell. There is no difference nutritionally between white and brown eggs, the color is determined genetically. The next thing to think about is what you are going to use to dye your eggs. The store-bought dyes are not so natural, and may have chemicals in them that you don’t want to get on your hands – nor do you want to eat an egg that has been soaked in them! 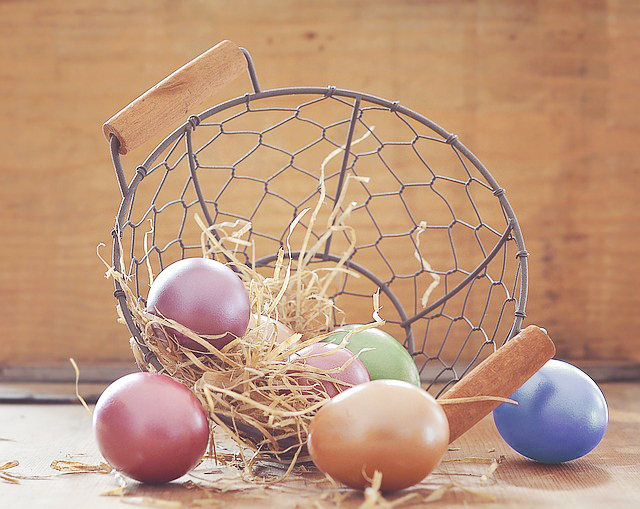 If you have kids and want to try something fun and different, or if you are a child at heart, here is a list of ways to make your own, natural Easter egg dyes. It is a lot of fun to make the colors yourself – be creative! Use a mug or large glass for each color you wish to make. Place the colorant into each much according to the color you wish to use. Add 1 teaspoon of white vinegar to each mug. Add approximately ½ cup of boiling water to each mug and mix. Dip eggs in solution. Remember, the longer the egg remains in the solution, the darker your colors will be. Allow your eggs to dry. If you wish for a shiny coating, you can rub your eggs with a little bit of olive oil.